Rasikananda Deva Goswami fully committing himself in body, mind and soul to the service of his guru. Indeed, he served him so well that in a short time he was recognized as Shyamananda Prabhu’s chief disciple, a very powerful preacher and acharya himself. In fact, it is a truism that a good disciple becomes a good teacher. Srila Rasikananda Deva Gosvāmī was born in 1512 of the Śaka era (1591 AD) in the village of Rohini or Rayni in the Midnapore district. This village is situated at the confluence of the Subarnarekha and Dolanga rivers. His father’s name was Raja Achyutananda and his mother, Bhavani Devi. The Subarnarekha River crosses back and forth across the present-day Bengal-Orissa border. Midnapore district used to be a part of the Orissan kingdom. Raja Achyutananda was an Orissan of the Karaṇa caste, the equivalent of the Kayasthas in Bengal. A Vaiṣṇava is beyond the material qualities and should not be judged in terms of his caste origins. Raja Achyutananda and Rasikananda were born in the Karaṇa caste in order to bless it. Rasikananda Deva Gosvāmī was a female servitor belonging to the conjugal loving mood in Krishna-lila. Though his spiritual master Shyamananda Prabhu had himself been initiated by Hriday Chaitanya Gosvāmī, who worshiped the Lord in the mood of friendship, he later took shelter of the conjugal mood due to the association of Jiva Gosvāmī. Shyamananda Prabhu thus initiated Rasikananda into the worship of Radha and Kṛṣṇa. In the village of Rayni lives the famous son of Achyutananda. He had two names: Rasikananda and Murari. Thus he was also known as Rasika-Murari. He became learned in the scriptures in his childhood. We learn from the Bhakti-ratnākara that when the son of King Dasharath, Lord Ramachandra, was exiled from Ayodhya, he spent some time with Lakshman and Sita in the village of Barajita, not far from Rayni. He there established the Shiva linga named Ramesvara. Achyutananda was a benevolent landowner who strictly followed religious principles and took good care of his subjects. His wife also had a good reputation as a faithful and loyal wife. Rasika Murari served his parents very expertly, bringing them much satisfaction. Bhakti-ratnākara also notes that he had a devoted wife name Icchamayi Devi or Icchadei, from village of Ghantashila. This village also has a certain history as a place where the Pandavas stayed during their exile. It was in this village that Rasika Murari first met his guru and received his grace, an event that has been elaborately described in the Bhakti-ratnākara. At dawn, Rasika Murari was on the lookout for his guru when he saw the tall figure of Shyamananda Prabhu approaching him, as effulgent as the sun. Surrounded by disciples like Kishor Das, he was dancing in a state of absorption in divine love while chanting ’Ha Kṛṣṇa Chaitanya! Ha Nityananda!’. Rasika Murari had been waiting anxiously for so long to encounter his guru that he immediately fell down at his feet. Śyāmānada Prabhu affectionately lifted him up, embraced him and drenched him with tears. Then, after giving him the Radha-Kṛṣṇa mantra, he offered him up to Chaitanya and Nityananda Prabhus. This whole event reveals how we can find a guru through sincere prayers. Rasikananda Deva Goswami fully committing himself in body, mind and soul to the service of his guru. Indeed, he served him so well that in a short time he was recognized as Shyamananda Prabhu’s chief disciple, a very powerful preacher and acharya himself. In fact, it is a truism that a good disciple becomes a good teacher. A spiritual master may have innumerable followers who call him their guru, but are disciples in name only. Only a true disciple who has dedicated himself completely to his spiritual master is imbued with all the powers of the guru. Shyamananda Prabhu invested Rasikananda Deva with such spiritual powers that he was able to convert many criminals, atheists, Muslims, and other fallen souls to the path of devotion, bestowing the jewel of prema upon them all. On one occasion, a wicked Muslim tried to silence Rasika Murari by having him attacked by an intoxicated elephant, but Rasikananda Prabhu was able to transform even the elephant into a disciple and engage him in the service of Viṣṇu and the Vaiṣṇavas. All who witnessed this amazing event were overwhelmed with astonishment at Rasika Murari’s spiritual power and the evil Muslim zamindar himself came and surrendered to him. Shyamananda Prabhu turned the service of his personal Govinda deity in Gopiballabhapur over to Rasikananda. He delivered unlimited living beings without any consideration of their caste or religious background. He preached in every village accompanied by his disciples, thus delivering innemrable living beings. He remained constantly intoxicated in Harinam sankirtan. Who will not be overcome with emotion on reciting his virtues? The Raja of Mayurbhanj, Vaidyanatha Bhanj, Gajapati, the zamindar of Patashpur, Chandrabhanu, the Raja of Maynar, Harinarayan, the Raja of Pancheta, Śrī Bhima and Śrikara, the zamindars of Dharenda; Ahmed Beg, the son-in-law of Ibrahim Khan, the governor of Orissa were all attracted to the transcendental power of Rasikananda Prabhu and became his disciples. Rasikananda Deva Gosvāmī wrote Śyāmānada-śataka, Bhakta-Bhāgavatāṣṭaka, and Kuñjakeli-dvādaśaka. Shyamananda Prabhu accompanied with many disciples went to Orissa from Bana Viṣṇupur for few days. As soon as the news spread, everyone rushed to have his audience. Rasikananda and others were exteremly pleased to see Shyamananda Prabhu in Nrsimhapur. Shyamananda Prabhu put on a large festival at Dharenda with Rasika Murari and Damodar that is still remembered today by his descendants. Disappearance It is said that just prior to Rasikananda Deva Gosvāmī’s disappearance, he went with seven of his disciples to a village named Bansdaha near Jaleswar. Mahāprabhu passed through this village when travelling to Puri with Nityananda Prabhu. Rasikananda Deva Gosvāmī and his disciples walked from there to Remuna, chanting kirtan the whole way. When they arrived in the courtyard of the famous Khirchora Gopinath temple, Rasikananda Prabhu suddenly merged into the Gopinath deity. His disciples also left their bodies in the same place. Rasika Murari’s flower samadhi and those of his seven associates are still maintained in the courtyard of the Khirchora Gopinath temple. An annual festival lasting twelve days is held in Remuna to celebrate his disappearance. This takes place starting from the day after Shiva-caturdaśī in the month of Magh. 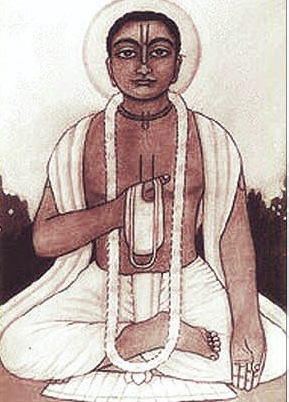 Visvambharananda Deva Gosvāmī, the author of the celebrated Āstikya-darśana, was Rasikānanda Deva Gosvāmī’s descendant.